Dunolly Cottage grounds include a hardstanding area for two cars with unrestricted in/out access, but at least three can be accommodated if required. There is a patio area between the rear of the cottage and the river and a further patio area to the side, which adjoins a lawn area. When the gates are shut the garden is fully enclosed, so that pets or young children are secure. Inside you will find three bedrooms, all with en-suite facilities. The two upstairs bedrooms, one twin bedded the other with a double bed, have showers and toilets. The downstairs bedroom has a king size bed and a full bathroom. At the rear downstairs is an open plan kitchen / diner. while at front left is the lounge. A utility area beneath the stairs houses a washing machine and tumble drier. 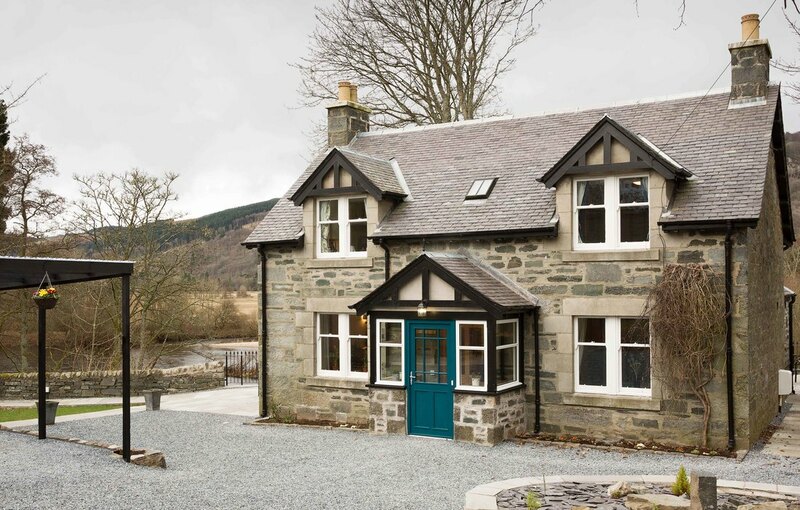 The cottage grounds sit approximately 30 feet above the River Tay footpath. Steps beside the cottage lead down to the path which leads, to the East towards the Wade Bridge and Black Watch Monument. Just beyond the bridge lies Aberfeldy Golf Club. Across the road from the Monument, lies the Putting Green. A short walk up the road from this point takes you into the town centre.